The global market for cryptococcosis exhibits a highly fragmented competitive landscape due to the presence of a large number of small, medium, and large scale vendors. Although the market is currently cluttered with the presence of numerous players, the global market for cryptococcosis was characterized by the presence of only a handful of players a couple of decades back. The market players who have existed in the market for a longer period of time have established their strongholds as against other relatively new vendors. However, it is doubtful that any of the leading players have been able to make handsome profits over the course of their existence. This is because the scope for research and development while formulating lines of treatment for cryptococcosis is extremely petty. The market vendors have been trying to emulate successful research pathways for treatment and cure of cryptococcosis but to no avail. The competition amongst the leading market players has been rising over the past years, and the entry of new players has added to the woes of the established players. It is anticipated that the market players would increase their investments in research and development to outdo the competitors. Furthermore, the large market players are expected to form strategic alliances in order to retain their supremacy in the market. 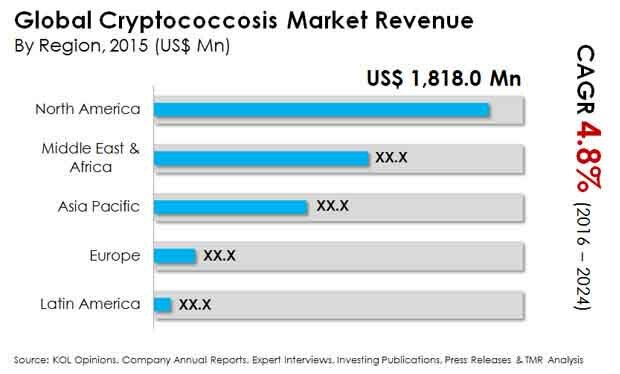 Some of the key players in the global market for cryptococcosis are Bristol-Myers Squibb Company, Pfizer, Inc., and Valeant Pharmaceuticals, Inc. The global cryptococcosis market is expected to grow at a steady CAGR of 4.80% over the period between 2016 and 2024. Moreover, the global market registered a total revenue of US$4.31 bn in 2016 and this figure is expected to elevate to US$6.2 bn by 2024-end. Cryptococcosis is mostly diagnosed in patients who are HIV positive, and hence, the rising number of such patients has given a boost to the demand within the global market cryptococcosis. Moreover, cryptococcosis was considered to be a rare disease a decade ago, but the world has witnessed an upsurge in the number of cases of the disease in recent times. This has been a key factor that has driven demand within the global market for cryptococcosis. The healthcare industry has been increasingly concerned with regards to the treatment of the disease following which the demand for amphotericin B plus oral flucytosin (an antidote for cryptococcosis) has risen across the globe. The handsome investments made by governments and international healthcare centers for the development of better drugs has also accelerated the growth of the global market for cryptococcosis. The high mortality rate of patients diagnosed with cryptococcosis has been a major roadblock to the growth of the global market for cryptococcosis. The mortality rate of HIV positive patients who simultaneously develop cryptococcosis almost tends towards 100%. This does not allow proper research about the causes, triggers, and therapeutic actions for cryptococcosis. Furthermore, the low cost of generic drugs has disabled the large market players from reaching out to the patients or consumers.